The simple truth is security is necessary for everything connected to the internet. Hackers use reputable sites to distribute malware to unwary users. People who access the web trough old out dated browsers such as Internet Explorer are easily infected. Once infected the person’s computer can help hackers carry out their plans. This infected computer can be used for many functions such as helping a DDOS (Distributed Denial of Service attack). A DDOS is when a network of infected computers are used to simultaneously attack a target. This same method was used in the DDOS attack that brought down much of America’s internet in October 2016. (TheGuardian.com) This is one of the many examples that your company dose not want to contribute. There are other more common reason’s a hacker will infect a website, for instance distribution of pornographic links or infecting your website’s users with adware causing artificial boosting of SEO to malicious companys usually in China that do not even ship the products sold. The hacker can even use your website to install Keylogger software to steal Credit Card numbers from your clients even though they do not enter the Credit Card on your site. Keylogger software stays in wait on a computer system and when a user enters a series of numbers such as 16 digits in Master or Discover Cards, this information is then sent to the hacker. The hacker can use the cards or commonly will sell the number online for as little as one dollar. We can go on and on about the importance of having a secure site and business even if you do not take or store personal information. One local site this month alone has received nearly 3200 failed attacks because of our protocols. If you are interested in seeing a hackers perspective of your business online or even in your office, let us know. We need no other access other than your permission to test. We can then advise on how to seal up these holes in your security. It is our wish to help Ozarks Area business to become a digital fortress not a target for low level hackers. Let us help you. The Sport Coat package is our basic web design. The website is built on WordPress and can be edited by the client with less than one hour training. Very simple, user friendly and of course everything we do is mobile friendly. The Suit and Tie package includes a sleek design made to be as awesome as your business. This is our most popular option. Businesses that choose this option are aware of the importance of branding and professional appearance to their clients. This package includes all of the basic features of the Sport Coat plus more! The Custom Tailored Suit can include custom programming or Web apps into your site. Imagine you want a custom quote calculator for your clients or to provide information that could be automated saving your company thousands of dollars per year. Automation of simple task are the future and utilizing these options now not only puts your company ahead of the competition but frees up human resources for other task. This programming package may be created in Android or iPhone applications and can often be programmed to the web allowing cost savings and potentially added features. 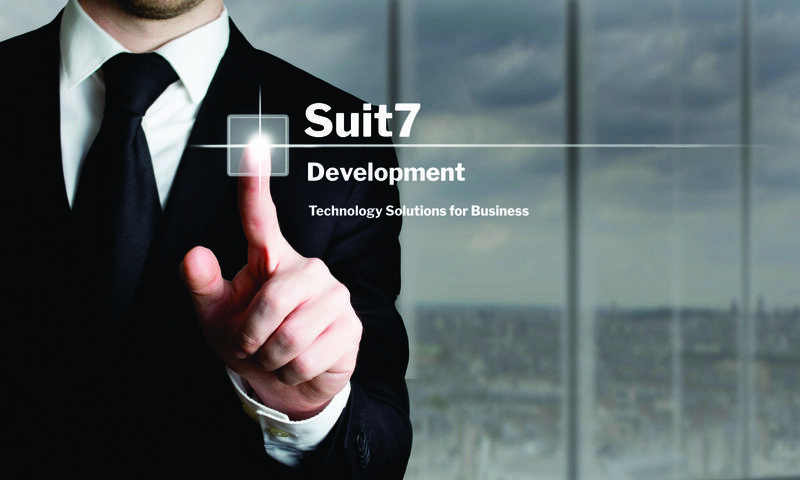 You know your business best, you have the idea; Suit7 can make it happen. Showcase your products and business to the world with Suit7’s Ecommerce package. This package carries all the features of the Sport Coat plus the wow factor of the Suit and Tie and is a fully functional online store. 100% Update-able to keep your business as future proof as possible.